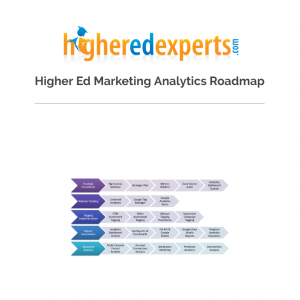 Focused more on action than memorization, this course will guide you through the creation and implementation of your measurement process for your website using the Higher Ed Digital Marketing Analytics Roadmap (HEDMAR) Framework. Why have 400 higher ed pros taken this course — and why should I? More than 400 of your higher ed colleagues have developed their measurement practice by taking this professional certificate online course from 2011 to 2018. This course on Web Analytics for Higher Ed was really good, but everybody was ready for a fresh approach. So, we decided to make it even better for you! Do I really need to take this course on Web Analytics for Higher Ed? Are you in charge of your school’s Google Analytics account, but aren’t sure what to measure? Have you been asked to create analytics reports about your higher ed website or web initiatives for your unit, college or university? Do you need to make recommendations to optimize the performance of your higher ed website(s) or other web projects? If you’re not sure where to start, this course was designed — and redesigned! — for YOU, so you can upgrade your Web Analytics and Google Analytics practice for your school. Should I take this course on Web Analytics for Higher Ed Course? Recognized certificate of achievement in web analytics for higher ed upon completion of the course with a final grade of 80% or more. This course is top notch! It will help you build a successful GA implementation plan and insight in how GA can leverage your website strategies. I would recommend the course. It wasn't quite what I expected. Though I don't feel like an expert in web analytics, I do have a much, much better understanding and can learn more on my own. This course was well-organized, and used real-world scenarios to teach us how we would actually use Analytics for our own websites. I have a better understanding of how to use Google Analytics, and how to explain the reports to our clients. Good course if you are nervous about getting started with Google Analytics. I would recommend this course to other higher education marketing pros. The course will help me expand my role in our team's marketing efforts for the college. This was truly what I need to contextualize the applications of Google and web analytics in a higher ed focus and begin adding this to my work. Invaluable skills were explained in a clear way, so I can explain it to others and apply also to other subjects. I would recommend this course for anyone in higher education who needs to learn how to use Google Analytics. This introductory course gave me the knowledge to start using Google Analytics dashboards, segments, and helped me to understand goals and KPIs. I certainly do recommend this course. I learned exactly what I was looking for: how to apply a higher education mindset to specific, relevant strategies and practical data analysis using Google Analytics. As I have often found in the higher ed web community, there is a lot of value in the peer discussions. We are all dealing with similar (some time the same!) issues. Advice and suggestions abound. The course gave me an excellent introduction to Google Analytics that is helping me focus on more informative data about our website usage. It directed me to think about what I need to know about our audience and how they use our website and from there how Google Analytics can provide those insights. Before I enrolled in the Web Analytics course, I was unsure of all the terms and metrics. After the course, I feel confident that I can sit at the table and make suggestions for our website based on the data in Google Analytics. The Web Analytics for Higher Ed (WAHE) course forced me to dive in and actively work through development of expertise in Google Analytics. From segments to goals to campaigns to dashboards, I'm coming away with a comprehensive understanding of best practices related to higher education. 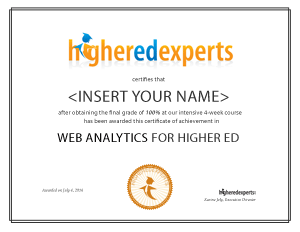 I would wholeheartedly recommend the Web Analytics for Higher Ed course. I knew bits and pieces of Google Analytics prior to taking the course, but the course really helped me connect all of those things (and taught me quite a few additional things about GA). I will definitely be able to apply this newfound knowledge directly to our institution's website strategy. This course has already provided me with a solid foundation and the beginnings of analysis on our website. The assignments were based on real-world examples from our own sites and proved to be practical right from the start. Now that the course is over I can bring ideas from the assignments to our marketing team for brainstorming and implementation. Having access to the course materials for a year will be a great help as we continue experimenting with finding data meaningful for our work. I highly recommend the course as an introduction to Google Analytics. I would recommend this course [to colleagues], but I would make sure they know the time commitment. It was sometimes difficult to meet the deadlines with my work schedule. But I did! I think it's something you need to carve out time to do. I would absolutely recommend this course. 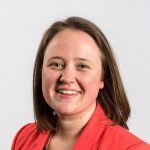 All the assignments were extremely relevant to my daily work, and the course helped me produce the building blocks for a broader digital strategy for our division. For those wanting to get a better understanding of Google Analytics, I definitely recommend this 4-week course. I've learned the basics of setting up KPIs, tracking codes, goals, funnels, campaigns, segments and dashboards. I like that the materials are available for one year and felt the workload was perfect and allowed me to be able to balance my workday with the additional class work. The web analytics for higher education course was great! I would recommend it for someone who knows about Google Analytics but doesn't have the confidence to go in and mess around. This course has inspired me to measure everything on our website. A good class if you want to focus on learning the basics of GA and getting up to speed quickly for our market segment. The best part is that the assignments have translated into tools I use every day! I would absolutely recommend this course. The knowledge that I had about analytics was minimal before starting on this journey. I literally had not taken a course in 25 years! Higher Ed Experts designed it to be very user friendly and each week builds on the previous one. I am literally shocked at the information that I was able to pull from our website as a result of this class. Professor Joshua's modules, class discussions, extra readings, quizzes, and assignments are both challenging and interesting. If you need extra help, he encourages you to connect with him and ask questions. He is very responsive and helpful. In addition, I enjoyed communicating with my classmates and learned from them as well. If you decide to take this course, you will walk away with analytics knowledge and a comfort level that is invaluable in our industry. I would recommend this course 100%. Before I took this course I knew very little about Google Analytics. Within just 4 weeks I was able to apply what I was learning and feel confident in my ability to analyze the data. For those wanting to get a better understanding of Google Analytics, I would definitely recommend this course. I learned that there is so much you can do with analytics including setting up dashboards that are tailored-made for the information that you and your colleagues want to see. 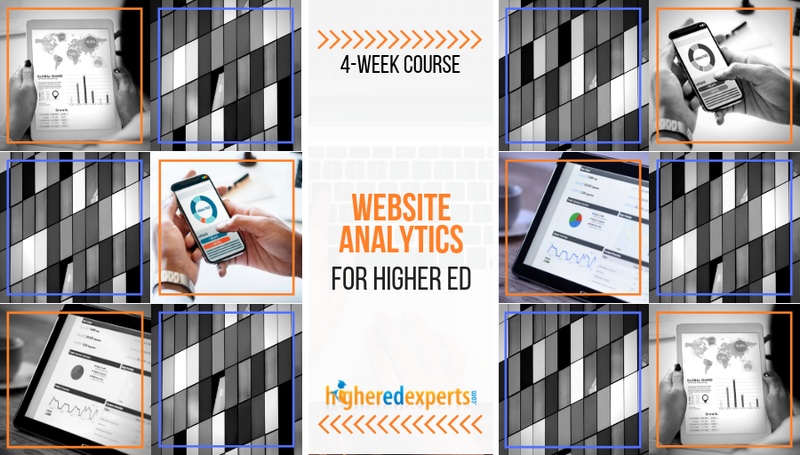 The 4-week course 'Web Analytics for Higher Ed' taught me the basics of setting up KPIs, tracking codes, goals, funnels, campaigns, segments and dashboards. As a marketing executive, it was an excellent format to fit into my busy schedule and to exchange ideas with colleagues. 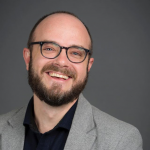 Our instructor, Joshua Dodson, did a great job of making Google analytics concepts easy to understand, even for someone starting with very little experience. I appreciated the interaction with colleagues from other institutions, and I learned from both Joshua and my fellow students. I created several Key Performance Indicator dashboards in this course that I will continue to use in my work. I am looking forward to using them to measure user behavior in ways that will help me optimize our website's goals. Excellent course, I will definitely be applying what I learned in my job. I like the fact the materials are available for one year and thought the workload was perfect and allowed me to be able to balance my workday with the additional class work. I would highly recommend taking this course if you are new to web analytics. The course provided me with the necessary foundation knowledge in Google Analytics. Now I feel comfortable in looking at Google Analytics reporting and knowing how to analyze the data. In addition, we learned how to set up Dashboards which is the really neat part. The weekly discussions with fellow colleagues provided me with fantastic suggestions from others working in higher ed marketing. In these past four weeks I've learned more about how to put Google Analytics to work than I have in the four previous years. Information was presented in a clear, concise manner, and the real-world assignments gave me the push I needed to use the learnings to collect data that was more than numbers for numbers' sake, but legitimate data to inform communication decisions. Great 4-week course on Google Analytics for those with very little to some knolwedge. I'm thrilled I now understand all of those additional components withing GA to really drive down into the data in helping adjusting website content, design and campaigns to meet our larger institutional goals. This course helps you learn so much about Google Analytics. We had Analytics running for our website but didn't realize how much we were under-utilizing it. Do not be scared to try this course - you will be pleasantly surprised at how much you can do through this tool. Not only did I expand my education, but I've become more confident using Google Analytics. If your director wants more stats than just "mine-are-bigger-than-yours," this course gives you the grounding in what else is possible. It's like reading the table of contents to Joy of Cooking -- you won't know how to debone a chicken but you will know they have bones and maybe that they take an hour to roast. GA is too broad and deep and higher education's needs too specific to go it alone unless you're one of those who taught themselves C++ on a weekend. Good course. This course is a great option for anyone in need of a formal introduction to Google Analytics or additional ways to leverage web analytics beyond basic page views and visit counts. I really enjoyed the course and found it very helpful and relevant. From never having worked with Google Analytics (or any other web analytics tools) I feel confident and competent using it now. From week 2, I was able to apply what I was learning in my job and make changes to marketing campaigns so they were more relevant, targeted and more likely to help to achieve our overall goal of converting users to students! The course readings were time consuming and the coursework required a fair amount of pactical application - anyone looking to do this should be aware that they'll need to put the effort in! However, as the course is only four weeks long it is easily achievable. This course served as an excellent resource to jump start initiatives surrounding analytics in my organization. The instructor approached analytics holistically while focusing on the content that is most relevant to post-secondary institutions. I highly recommend this course. There is a good amount of work associated with the course, if you truly want to complete all readings, videos, and assignments to the best of your ability. However, if you do put the time in and do all that's asked of you, the result is incredibly rewarding. You come out with a very good understanding of web analytics and how to put analytics in motion. Fantastic course, I am really glad I took the course as it definitely has made me feel much more confidence in using Google Analytics at work. It is not too intensive that it detracts from my day job, and the different subjects that build on the previous week keep you interested and focused. I would definitely recommend the course. I think it is a great way to get directed help and instruction on using Google Analytics, which is a powerful tool that can be a little overwhelming if you are not used to it. This course offers practical ways to better align your Google Analytics tracking with your institution's varied business objectives. The discussions and assignments provide a great place to start to working through individual challenges while being introduced to new tools within Google Analytics. I would definitely recommend this course to anyone who is interested in acquiring not just a better understanding of Google Analytics, but anyone who wants to understand more about measuring and tracking marketing and communications ROI. Though I have been using Google Analytics in my work for a long time, I haven't always managed to keep up with all the changes. This course caught me up and showed me a lot of tools I hadn't been using. A great way to quickly learn how to use Google Analytics for marketing and recruitment. The time required for the readings and assignments was manageable given my workload, and the length of the class was just right. The assignments were all immediately applicable to my job and deliverable to my supervisor. I can't wait to now explore Google Analytics more on my own! I would definitely recommend this hands-on class to anyone working in higher education who has a basic knowledge of Google Analytics, but wants to be able to use it more effectively. The projects were designed to be immediately applicable to my job. I have shared information I learned about campaign tracking with staff who are excited to be able to track the progress of their marketing efforts through Google Analytics. I have also already used some of my new-found knowledge to create reports which will show us where we need to make adjustments to our website so that it is a more effective marketing tool. The instructor was very knowledgeable and responsive to questions, and the ability to share experiences in the discussion area with staff from other higher education institutions was invaluable. I would recommend this course for anyone who's ever logged in to look at your school's analytics and gotten frustrated or overwhelmed. This course breaks down the complex world of analytics and helps you identify actionable metrics to help improve your website. This course helped me understand and explain the data that is being collected. It also reinforced that it is extremely important to ask questions and grasp the overall picture before analyzing the data. This opened my eyes to a whole range of ways to quantify the work happening on our website and taught me that there is so much more to show decision makers than just pageviews. I was able to take what I was learning from the course and immediately apply it to scenarios in our Institute. It gave me fuel to argue for goal-setting, campaign-tracking, implementing event-tracking and making other needed changes. It gave me other valuable insights into our websites which I hope to apply. This is a great course to get you started or further your understanding of how Google Analytics can help your institution. The variety of material and the focus on higher education will allow you to get results right away. This course was well organized and informative. The instructor was very knowledgeable and thoughtful in his critiques. Great course! I would recommend the course for anyone responsible for improving the use of Google Analytics in their organization. This class really developed my understanding of Google Analytics and the depth and breath of information that is available with the GA software. I would definitely recommend this class to my colleagues. This course will provide someone with limited Google Analytics experience a good overall familiarity with the product, while also introducing the analytics concepts and practices that are needed to understand and apply the reports. I learned what data I should be focusing on, and what was less important. By narrowing your attention to where it needs to be, you will be much more effective in analyzing your data so you can focus on applying the improvements that it guides you to make. I'd definitely recommend the course to others. It gives you the knowledge to go beyond the basic metrics and start to understand how to dive into the data to make strategic decisions related to the web and other marketing efforts. This course took a program with a rather intimidating interface and made it easier for me to understand what I was seeing. I am now able to look past the interface and dive into the analysis of the data without hesitation. I would definitely recommend this course to anyone looking to gain a better understanding of Google Analytics. I love the online format and the 4-week sequence is perfect. It gives you the opportunity to really absorb the information and put it into practice. I feel like I've retained more by having it spread out over 4 weeks as opposed to a 1- or 2-day course. I'd recommend this course to anyone looking for a better understanding of how to use the wealth of information in Google Analytics. Learning how to drill down into the information to get to actionable metrics that make sense will really help our marketing and strategy decision makers. Looking good doesn't hurt either! Google Analytics is very powerful, and easy to get distracted in minutia. This course helps you focus on the measurable outcomes that you can easily tie to institutional goals. So, if your website is the “front door” to the institution, it’s possible to connect web actions to goals. This was a great introduction for someone that can't get the necessary resources/support through their own campus technology department that manages Google Analytics. As someone who's never delved into web analytics before, this course helped me create a solid foundation of skills that I can use with any website. This is definitely something I wouldn't have been able to achieve so quickly by myself, so I definitely think this course is worth it! I would highly recommend this course to anyone and looking forward to other courses you have in your catalog. Excellent job! This course contains tons of good information that can help you make the right decisions about your website. It opens the door to a world of valuable knowledge of your visitors' wants and needs. But be prepared - it's hard work, and you need to make time for learning! This was an incredible course that has given me the tools - both tangibly and intellectually - to execute measurements that I intuitively knew were possible but just wasn't equipped to execute. I'm so glad someone recommended this course to me, and now I'm happy to recommend it to others... even non-techies. I found this course to be very hands-on and full of insights and tips on how to take Google Analytics reporting to the next level. Setting a goal for a higher ed site, developing KPI's and making a dashboard are no longer a big mystery! I discovered very actionable insights that will improve our university's web and social media marketing efforts. Highly recommended! Fantastic course! Going to make a world of difference for me and my operation as I seek to corral the chaos and create some structure/methods for how we work on the web at my institution. It’s all about metrics. This was a great class. It definitely helps demystify how things work, and I'm not scared anymore to use some of the technology that has fallen into my lap. My approach to analytics has evolved with each successive week in the course. I've learned to use analytics to automate reports for data I used to spend days mining by hand. This course is very interesting and definitely starts one on the path of becoming a GA ninja. It made me realize the importance of reporting data that is meaningful to decision making, not just reporting data for data's sake! I will never again present lengthy analytical reports providing data that was amazing to me (and probably to me alone), as this doesn't help influence decision making. Great content, very relevant. And, thankfully along the way we are building things we can actually use! Finally, an Analytics course focused specifically on the needs of higher education!!! This course was exactly what I needed to pull me out of the quagmire of Analytics data and get me on the road to effectively utilizing our metrics to improve our institutional website. Many, many thanks, Higher Ed Experts! I’ve been extremely happy with this course. I was worried going into the course that I might not be able to follow the instructor or handle the work, but the material is as promised: you don’t have to have a high level of technical experience with GA to learn the material. All weekly modules, essentially, help you discover what you don’t know as much as they teach you new things, and I know that I’ll need to review the material a few times to really become confident with it. But this has been exactly the in-depth explanation I hoped it would be. Great course, extremely relevant information with a nice mix of theory and practice. Highly recommended to anyone looking to move beyond the basics of Google Analytics and adopt a more strategic way of looking at data. I found the course tremendously valuable. Obviously I learned new techniques to more fully utilize Google Analytics, but the course is much more than a practical “how-to” guide. The focus on KPIs and their connection to an institution’s goals and objectives was the most enlightening. This focus aided me in developing a strategic mindset with regards to the use of web analytics. I would recommend this course. The fact that it is asynchronous is a huge bonus, and you do get pretty deep into the content. It was great getting to interact with the other students, and the instructor was very responsive to questions. The content presentation felt a little disjointed at times, and it probably took a minimum of 10/15 hours each week to complete readings, discussion posts, and assignments--but in the end I am definitely walking away with more knowledge than I went in with--so I'm pleased. This is a thorough introductory course for Google Analytics, one that will give you the basic tools you need to gather meaningful data on your website.